War & Peace Check In: December or WOOOOO, We're Done! Congratulations everyone! If I could, I'd bring you all cookies, instead we'll just have to settle for a minor celebration on my blog. Um, I meant to write this immediately after finishing and didn't so my thoughts are brief. I liked the first epilogue SO MUCH. In fact, all the stuff about Rostov and Marya was delightful (Rostov seemed a bit of a predecessor to Levin in the epilogue!). I was a little surprised by how Natasha ended up, but not bothered by it. The second epilogue was dreadful, but served as a wonderful reminder that I was glad to be finished with War & Peace! 1) When did you finish? 2) What surprised you most about reading War & Peace? 3) Who was your favorite character and did that change during the course of reading? 5) Is there anything you would have changed about the book? 6) What did you like best about it? 7) What did you like least about it? 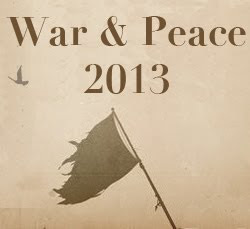 8) What advice would you give someone who is planning to read War & Peace in 2014? 9) Did you reward yourself when you finished? Be sure to check out the posts in the War & Peace Carnival as well! It's been a pleasure! 2) That it's not as good as Anna Karenina! 3) Maybe Rostov? or Marya. I felt like I could relate to her the most. 5) Yes, I loathed all the war strategy scenes and such. lol @ me. 6) I liked most of the peace parts a whole lot. 8) Just remember...there is an ending.